As hail storms become an ever-increasing part of our climate, and the severity of these events has a greater impact and causing wide spread damage in many cases, Car Craft now offers a one-stop shop for all your hail damage repairs. As a hail event can cause two levels of damage, Car Craft has the ability to provide both paintless dent repair (PDR) and conventional repair methods to ensure that no matter what repair is required, repairs will be carried out in accordance with current industry practices. 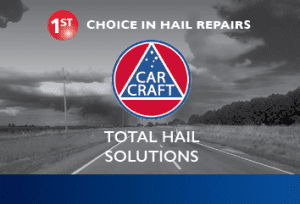 The team at Car Craft Total Hail Solutions are experts in their field and have over 50 years combined experience in PDR and coupled with access to over 110 businesses in the Car Craft network across Australia, we are confident we can help you.